Now available for licensing, this patent covers RFID tags with globally unique serial numbers in conformance with global serialization standards. This is the key to assuring unique numbers without requiring a hierarchy of continuous online connections to a numbering authority. This patent covers RFID tags used in or entering the United States with cryptographically-generated Access or Kill passwords. This is the key to building a globally scalable secure EPC tagging system with source authentication. 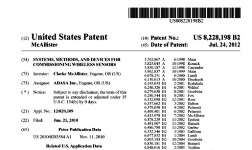 This patent covers semi-automatic RFID encoder applicators. Devices of this type are used for the early stages of EPC rollouts where tags and inlays are applied in distribution. This is because fully automated upstream tagging in manufacturing is not economically justified.